This outstanding 'Hampton's' style home (Circa 1927) makes a statement in unrestricted family living with flawless style and comfort. This is the perfect property, providing the right buyer an uncompromising home that combines the very best in design and lifestyle. Automated wrought iron gates open to reveal a private jacaranda-lined drive, curving toward a striking home complete with wide verandahs and a covered entry portico on an elevated 1247m2 of lush child friendly manicured grounds. Once inside, the scale and livability of this home's 471m2 internal floor plan is immediately evident. The lower level reveals a sprawling layout that seamlessly merges one living area with another. Generosity is an understatement as formal and informal spaces combine in an open floor plan that leads to the expansive verandah through concertina French doors to promote natural light and cooling breezes throughout. Bespoke styling ensures a calming ambiance enhanced by intricate interior detailing. This includes, the formal entry with marble floors, high ceilings, custom cut brush box timber floors and beautiful architraves through the casual dining area, while the formal lounge features a fireplace, original plaster work ceilings with views over the serene in-ground pool, terrace and undercover pavilion offering excellent entertaining options. The oversized kitchen is positioned to allow easy service to the dining area and outdoor spaces, creating the perfect layout for entertaining. Custom built cabinetry, shelving and a walk-in pantry ensure more than enough storage, and expansive bench space with double thickness honed black granite provide plenty of preparation space. Quality gas appliances (including an ILVE stove) offer premium functionality while maintaining the aesthetic beauty of this gourmet kitchen. There are four bedrooms on the upper level. The impressive master can only be described as a private parent's retreat complete with a sitting area and private balcony that captures river breezes. There is also a custom built walk-in robe and private marble ensuite. A private self-contained hideaway with fifth bedroom above the four car lock-up garage is ideal for older teens or guests. A home of this calibre would only be complete with a laundry list of additional features designed to ensure your absolute comfort and convenience. 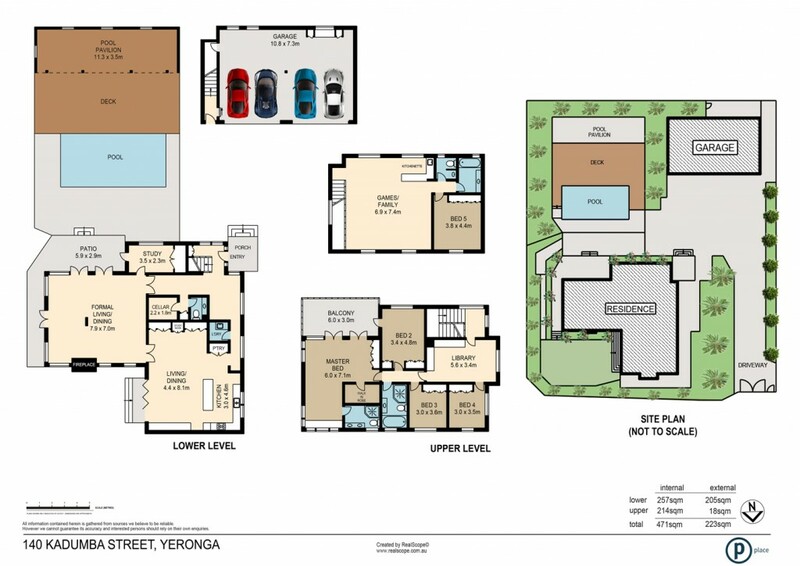 Inclusions such as a separate study, lockable wine cellar, custom made library and separate gaming room with a kitchenette/bar area, ducted reverse cycle air conditioning throughout and a four car garage with two automated roller doors complete this picture perfect Yeronga home. When it comes to lifestyle, peace and tranquility is assured with a position on the Brisbane city fringes. Escape the bustle without sacrificing easy access to the CBD. The Southbank Parklands are only minutes away for quality dining and entertainment, and the Mater Hospital, private schools and University of Queensland are close by to ensure the needs of the modern family are well and truly met.